Hundreds of law enforcement officers from across California met in San Jose Thursday for high-caliber competition and Special Weapons and Tactics training. Anoushah Rasta reports. Hundreds of law enforcement officers from across California met in San Jose Thursday for high-caliber competition and Special Weapons and Tactics training. With the recent school and workplace shootings, first officers on scene cannot wait for a SWAT team to arrive, they trained to be able to take on that role themselves. "Ever since Columbine, it has changed to the point where, now, patrol units are being trained," said Lieutenant Steven Hernandez from the Santa Clara County Sheriff's Office. "You never know what’s coming next. You never know the thought process of the person you are dealing with." 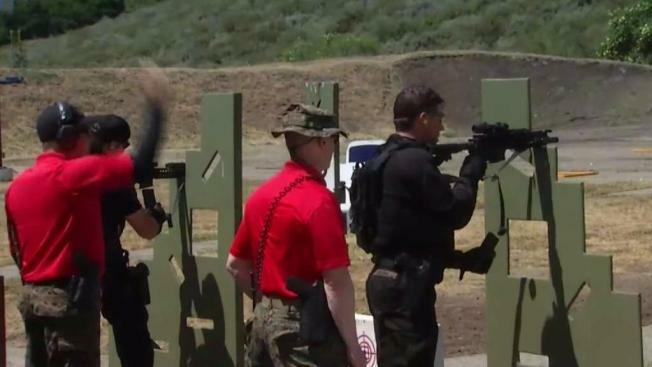 Officers from 27 agencies across the state compete once a year at an event called Best in the West SWAT Competition paid for by The Gifford Foundation. "It actually elevates their level of skill and it brings it back to the community," said Jacquelyn Gifford Disney from The Gifford Foundation. The competition included skill training and practice for all kinds of emergencies, including a hostage situation on a school bus. "Really the purpose it serves is to make sure that we're all learning from each other, that we're learning tactics, that we’re practicing," said Sheriff Laurie Smith from the Santa Clara County Sheriff’s Office. The Santa Clara County Office even has a trauma surgeon trained in SWAT tactics. "I can be attached to the SWAT team and actually go into an active law enforcement environment and at the same time, I'm trained as a surgeon to render emergency care for anyone that may be injured," said Victor McCray, tactical physician and reserve deputy. Whether a doctor or a police officer, in the age of modern crime, life-saving strategies continue to evolve.